This week we’ve uploaded 6 beautiful new CV templates to the site, continuing the trend of ‘theming’ our templates around careers. All of these new templates are created using tables, so they’re very easy to work with, especially if you follow our guidance in our recent post ‘How to edit your CV‘. We’re pretty excited by these new designs and hope you love them as much as we do – as always, wishing you every success with your dream job hunt. Click on a heading to visit the individual CV template page. 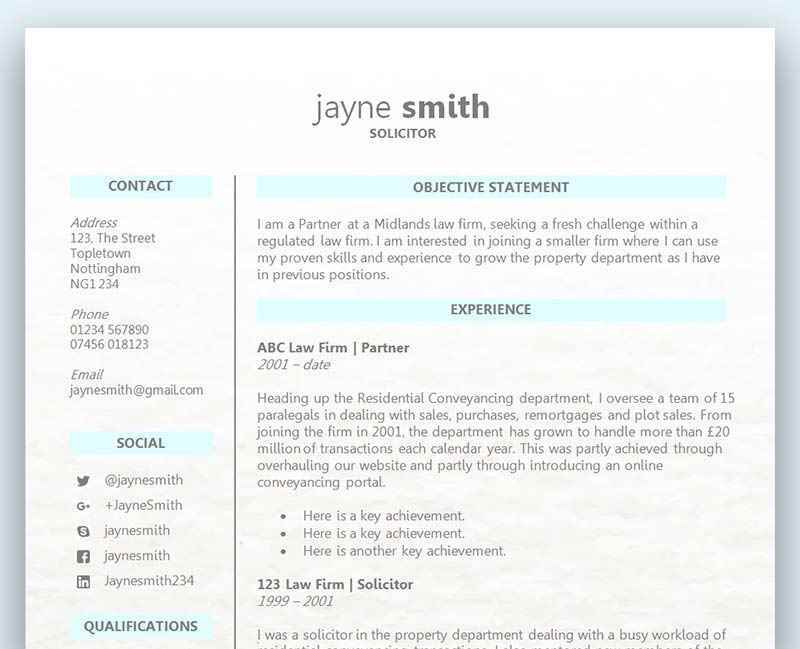 There are so many lovely features in this fresh ‘Secretary’ themed CV template that it’s hard to know where to start. First off, it’s worth mentioning that the ‘Secretary’ reference only refers to the example content – the template itself is perfectly suited to a whole range of careers. The template is two pages, starting and finishing with the same bold band – and it neatly organises your information using dotted sub headings breaking up each part. The icons used next to the contact information are taken from a font so they’ll size and print beautifully. This is an attractive two-column CV template which sets out all your information on a single page, although it’d be quite easy to extend to more pages. It uses a lovely ‘property’ motif and ‘windows’ custom bullet points for the lists – with shaded headings and attractive spacing. This truly beautiful 2-page CV template features neat cogs for each section, dividing the information up in an eye catching way with plenty of space. Split over two pages, there’s room for quotes from your references or key achievements and these are included early on for maximum impact. This is a slightly more traditional layout for a CV template that is nonetheless beautifully spaced. It starts out centred with a generous skills section split into three columns – after which, it switches to the more typical two column presentation, with plenty of space for all your details. Another two-page CV template, our accountancy layout oozes professionalism and style, with plenty of white space and a crisp easy-to-read font. Like so many of our themed templates, the accountancy reference refers only to the example content and therefore the template could be used for many different roles. Last but most certainly not least, our super-stylish fashion CV template puts all your details on one page, with two columns splitting up your key information. Perfect for any role where an element of creativity is required, the centre image could easily be replaced by something else (such as one of your own dress designs).